Thatcham car alarms, Professional mobile installations, all areas, Car Alarms From Clifford, Toad, Autowatch And Hornet.,Edinburgh Glasgow Aberdeen, Dundee, Inverness Fully Guaranteed Mobile Installations. CAR ALARMS FITTED SCOTLAND. Fife, Kirkcaldy. Fully Guaranteed Thatcham cat 1 Car Alarm Installations Throughout Scotland . Thatcham Cat 1 Car Alarms, motorhome alarm, Fitted Throughout Scotland Since 1988.
expert "On-Site" Installations. Glasgow, Edinburgh, Dundee, Fife, Kirkcaldy, Glenrothes, Dunfermline. Thatcham Approved Car Alarms Fitted At Home Or Work Across Scotland. FreePhone 0800 1223 156. Note: You May Experience an 8 to 10 Second Initial phone line Connection Delay. The Convenient Way To Professionally Secure Your Vehicle Across Scotland Since 1988 .
calling From A Mobile? You May Prefer To Call 07894 500229 o2 mobile network. New ! Now Available Anti peel Back sensors !! Many Insurance Companies Offer A Discount If A Thatcham Approved Alarm / Immobiliser System Is Installed, Below You Can Find Some Of the Most Popular And Reliable Cat 1 Systems Available. If You Don't See The System Required, It Does't Mean That We Don't Supply Them! So Give Us A Call. Be Aware - Did You Know? 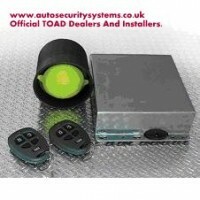 Reputable Car Security Dealers DO NOT SELL THATCHAM APPROVED PRODUCTS FOR D.I.Y. INSTALLATION - FULL STOP! All Thatcham Approved Alarms And Immobilisers Must Be Supplied And Installed By The Official Alarm Dealers To Retain Their Insurance Approval Status And Even The Product Warranty! IN SHORT - If the company suppling Your Thatcham approved Alarm Does Not Also Fit The Alarm system Then Watch Out! - Your Alarm Installation Will Not be Recognised As a Thatcham Approved Installation, Even If You Have A certificate "Out The Box" - Therefore Wasting Your Money And Time, IMPORTANTLY - The Alarm Warranty Will ALSO Be NULL AND VOID As The Company Suppling The Alarm Will Not Warranty An Installation Carried Out Elsewhere - Even If They Imply Otherwise! THE THATCHAM ALARM MANUFACTURER WILL ALSO NOT ENTERTAIN ANY WARRANTY CLAIM ON SYSTEMS WITH A NON APPROVED DEALER INSTALLATION - SO PLEASE BE AWARE - And Keep yourself right When It Comes To Your Hard Earned Cash And Of Course Your Insurance Policy Itself. By Autowatch, Hornet, Toad, Clifford, Viper, Cobra. Toad Ai606 Thatcham Cat 1 Alarm/Immobiliser Fitted Across Scotland. Note: Despite being one of the older cat 1 system available and no Longer The Market Leader, the Toad ai606 Still Represents An Effective Security System . Been around for years and when it comes to functions and features - shows it! budjet and not expecting too much - It will do the job well. but lets face it at around a 14 year old design you get what you pay for. Mobile Car Alarm Fitting Service Across Scotland. Autowatch advanced security systems offer you the ultimate in engineering excellence and reliability. Cat 1 Ultrasonic Alarm/Immobiliser System. On-board Dual Circuit Immobilisation Self-arming Immobiliser. Battery back-up siren With Data Link Auto Re-arm Alarm ( selectable ) Auto -arming Alarm (selectable ) Lock/Unlock with ignition (selectable ) Pager output neg out (Selectable) Negative Output when armed (Selectable) Ignition Anti-Hotwire Feature Key Guard Anti-key Theft Anti Hi-Jack Facility ( Cost option, When "Key Guard" Is Installed,Even If A Thief Has Your Car Keys And Autowatch Remote Control, Your vehicle will Be Impossible To Start! Similary If You Are Hi-Jacked, When The Vehicle Engine Is Switched Off It Will Then Be Impossible To Re-Start) Indicator / Park-light Flashing Door Open audible warning Anti-tamper Security Housuing Remote Panic Alarm Facility Built In Wireless Sensor Capability e.g. Install A Wireless Sensor In Your Garage, If A Thief Enters, Your Autowatch 457 car alarm Will Sound Even If Your Car Is Parked On The Street ! Built In Output for Gps/GSM Tracking And Paging Devices. PLEASE NOTE : Exact Installed Price is Vehicle And Location Dependant. Interested In A Fitted Price For Your Vehicle? Call Free From Any Landline on 0800 1223 156. 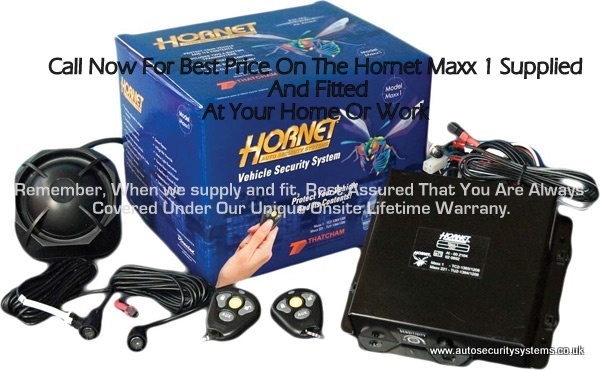 Have The Hornet Maxx 1 750t Supplied And Fitted At Home Or Work Across Scotland *Exact Price Is Vehicle and Location Dependant. Call Now For A Great Fitted Price For Your vehicle! This Entry Level Thatcham cat 1 rated system is perfect for those people On a Restricted Budjet whom require an Insurance Approved Alarm System . Thatcham Evaluated Category 1 Car Alarm. Full Central Door Locking Control capability. 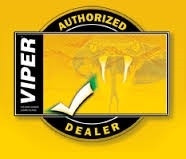 PLEASE CALL NOW OR E-MAIL US, FOR THIS CAT 1 SYSTEMS EXACT INSTALLED PRICE FOR YOUR VEHICLE. Thatcham Cat 2-1 Upgrade Car Alarm with On Site Installation Across Glasgow And Much Of Strathclyde, Scotland. Clifford''s Leading Thatcham Category-1 Car alarm system meets and exceeds the highest standards of the UK insurance industry, and installing one may qualify you for discounted vehicle insurance as a result. The Concept 650MkII''s built-in tandem immobiliser circuit is self-arming soon after you park so that your vehicle always remains protected, and these main electronics also reside in an armoured-steel enclosure as an added security measure. Uniquely, this Alarm system is now offered with three separate sensor-package options so you can select the most suitable protection for your specific requirements; Choose from Ultrasonic interior movement sensing, Dual-Zone Proximity which includes external warn-away zone, or combined Glass Tamper and Tilt & Motion sensor packages – or perhaps even combine two or more options to be really secure! Clifford Car Alarms Fitted Across Scotland. Email Us For A Fully Fitted Price For Your Vehicle. Car alarms fitted scotland mazda bongo, subaru imprezza, mitsubishi pajero, evo, honda integra alarms scotland. 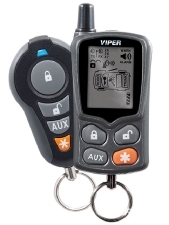 Viper 480 xv Responder car alarm Fitted Across Scotland. FreePhone 0800 1223 156. Note:You May Experience an 8 to 10 Second Initial phone line Connection Delay. The Convenient Way To Professionally Secure Your Vehicle Across scotland. Email us For a Fully Fitted Price For Your Vehicle ! 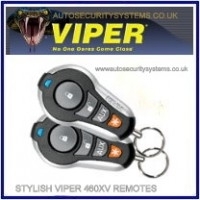 Some Vehicles may need an additional door motor to be fitted to activate remote central locking. Some cars may need an additional window module to be fitted to close the windows. 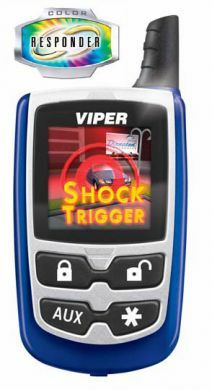 This Color OLED Responder System from Viper is the most sophisticated 2-way Color Security and Remote Start system in the world! The interactive display on your Color Responder remote confirms all commands – virtually instantly – with easy to understand icons and animations. It alerts users to security system triggers by beeping or vibrating when out of audible range of the siren. And of course this system will also start your vehicle with the push of a button, and you will get confirmation back that it started from up to one-quarter mile away. Please refer to the technology section for more information about color OLED technology. Thatcham cat 1 fitted car alarms scotland. 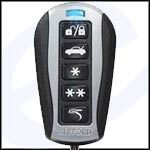 This Is Clifford's top of the range Thatcham Categor y 1 Car Alarm system Installations Across Scotland.. The Clifford Avantguard 5.5 Car Alarm is the ultimate combination of convenience and security. This system comes complete with glass tamper, tilt, motion and dual zone proximity sensors. The complete sensor package Gives You the highest level of security for your vehicle. Supplied and Fitted From Just £399.99 (excludes Proximity sensor ) fully Inclusive. ALL PRODUCTS WE SUPPLY AND INSTALL ARE COVERED BY AN ONSITE WARRANTY, THATS TO SAY, WE COME TO YOU IF YOU REQUIRE SERVICE, ALL OUR WORK , WIRING AND CONNECTIONS COME WITH A **LIFETIME ONSITE GUARANTEE. Remember All Thatcham Approved Alarms Have To Be Proffesionally Installed By Official Dealers To Keep Their Cat 1 Status And In Most Cases Even Their Manufacturers Warranty ! FreePhone 0800 1223 156. Note: You May Experience an 8 to 10 Second Initial phone line Connection Delay. The Convenient Way To Professionally Secure Your Vehicle. If Calling From A Mobile You May Prefer To Call 07894 500229. o2 Mobile Network.